I recently received an email from one of our grantee partners in Ecuador, the Asociación de Producción de Cacao y Derivados Aromas del Sur (ASOPROMAS). Carlos, the project coordinator, was confirming that he had received my email with a question about the project. It was nothing out of the ordinary. But he continued on, telling me that the training they just had on improving the quality and taste of chocolate was fantastic and that he and the rest of the group were more motivated than ever after that workshop. He ended the email with, “muy lindo el mundo del cacao y chocolate” (“the world of cacao and chocolate is very lovely”). It made me chuckle, but I also realized something: his world is a world of chocolate and cacao — and not because he is a chocoholic. Carlos is one of 60 members of ASOPROMAS, a group of cacao farmers that started a project funded by the IAF in 2014 to improve the quality and production of cacao and to increase marketing skills. Playas de Cuje, the small town where the group is headquartered, is located in the Zamora-Chinchipe province on the edge of the Ecuadorian Amazon. It sits in hot and lush lowlands where birds argue loudly over the different fruits in trees around the village. Members provide about 55 percent of the raw cacao that they use to make chocolate, and the rest is purchased from other local farmers. Since implementing the project and producing more chocolate, ASOPROMAS has been able to employ 15 part-time workers in various positions to help with chocolate production, marketing and finances, as well as in other areas. Carlos and his colleagues are proud of how far they have come in such a short period of time. On a visit he gave me a tour of the near-completed processing center and showed me how they turn cacao beans into the delicious chocolate that we all love. The center is schedule for completion in November 2017. It’s always a shock for people to see for the first time the raw product that ends up as chocolate. A group of large beans tucked in a gooey pulp, or “baba” as they say, doesn’t exactly scream yummy. 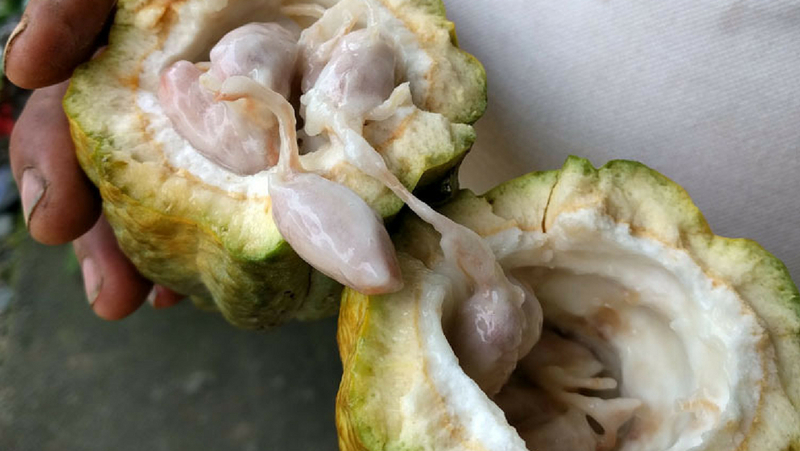 (I sent pictures to my cousins who had never seen the fruits of the cacao pods and, to be honest, they were grossed out and talked about how maybe that would help them with their diets.) From this alien form, ASOPROMAS creates delicious chocolate bars, bonbons, marmalade, cacao cream and small chocolates with Amazon fruit accents. For chocolate consumers like my cousins and myself, all we usually care about is the final delectable product. But to Carlos and others, it’s their life. They live and breathe chocolate — literally. Carlos’ house is just a few meters away from the processing plant, and the smell of chocolate is always in the air. When its processing plant is complete, ASOPROMAS will be able to produce approximately 4,000 chocolate bars, 1,500 packages of bonbons, and other products each month. ASOPROMAS representatives currently attend about three fairs each month where they promote the group’s chocolate brand, Tukakao. ASOPROMAS has also expanded its marketing and now sells its chocolate in a number of small local stores, supermarkets, restaurants and hotels. Their chocolate also sells in Loja and Cuenca, two of the largest cities in southern Ecuador. ASOPROMAS sells dry cacao beans to a chocolate producer in Quito that markets the final product in Japan. Later this year, other IAF grantee partner groups from Costa Rica will visit ASOPROMAS to learn about its processing and to share successes and challenges. The IAF supports these artisanal chocolate efforts because they provide jobs that stimulate local economies and because the production methods used by our chocolate-producing grantee partners are earth-friendly. Plots are diversified, providing producer families with a variety of healthy fruits and nuts along with the cash crop they so love to produce. These types of production and marketing activities provide opportunities for young adults to stay in or return to their communities of origin, work their families’ land, and make sufficient income to live without having to move away. One of the members of ASOPROMAS, Nancy, told me recently that although she had moved away and worked for 16 years in Guayaquil, Ecuador’s largest city, she came back to Playas de Cuje to work on her family’s cacao farm. She didn’t like life in the big city and wanted to return. Cacao gave her that opportunity. With so many jobs created, people engaged, and families benefiting, I think we’d all have to agree that yes, Carlos, when it’s done right, the world of cacao and chocolate is very lovely.